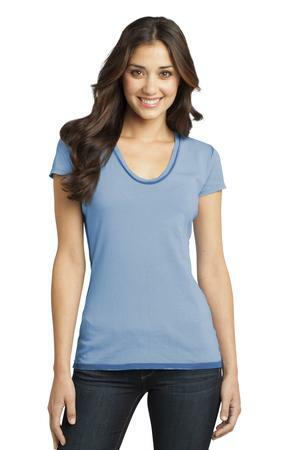 The District Juniors Faded Rounded Deep V-Neck Tee Style DT2202 is available in Juniors Sizes XS-4XL. It can be purchased in your choice of the following colors: Blue, Charcoal, Forest Green and Red. The District Juniors Faded Rounded Deep V-Neck Tee is ingrained with spirit. Our tee has attitude and color concentrated in the seams. Made with 4.4-ounce 100% ring spun combed cotton and 30 singles this faded fabric infuses each garment with unique character. Please allow for slight color variations. Be the first to review “District – Juniors Faded Rounded Deep V-Neck Tee Style DT2202” Click here to cancel reply.